Stroud, Julia Banks, Laura and Doughty, Karolina 2015. Community treatment orders: learning from experiences of service users, practitioners and nearest relatives. Journal of Mental Health, Vol. 24, Issue. 2, p. 88. Hardy, Mark and Jobling, Hannah 2015. Beyond power/knowledge—developing a framework for understanding knowledge ‘flow’ in international social work. European Journal of Social Work, Vol. 18, Issue. 4, p. 525. Sharma, Vimal Kumar 2013. Community treatment orders – principles and attitudes. The Psychiatrist, Vol. 37, Issue. 02, p. 58. Lally, J. 2013. Liberty or dignity: community treatment orders and rights. Irish Journal of Psychological Medicine, Vol. 30, Issue. 02, p. 141. Coyle, Delphine Macpherson, Rob Foy, Chris Molodynski, Andrew Biju, Maya and Hayes, Joseph 2013. Compulsion in the community: mental health professionals' views and experiences of CTOs. The Psychiatrist, Vol. 37, Issue. 10, p. 315. Manning, Catherine Molodynski, Andrew Rugkåsa, Jorun Dawson, John and Burns, Tom 2011. Community treatment orders in England and Wales: national survey of clinicians' views and use. The Psychiatrist, Vol. 35, Issue. 09, p. 328. Woolley, Sarah 2010. Involuntary treatment in the community: role of community treatment orders. The Psychiatrist, Vol. 34, Issue. 10, p. 441. Macpherson, Rob Molodynski, Andrew Freeth, Rachel Uppal, Amjad Steer, Hannah Buckle, Dave and Jones, Anne 2010. Supervised community treatment: guidance for clinicians. Advances in Psychiatric Treatment, Vol. 16, Issue. 4, p. 253. Lawton-Smith, Simon Dawson, John and Burns, Tom 2008. Community treatment orders are not a good thing. British Journal of Psychiatry, Vol. 193, Issue. 02, p. 96. Askey, Jane 2007. Dual diagnosis: a challenging therapeutic issue of our time. Drugs and Alcohol Today, Vol. 7, Issue. 4, p. 33. Roberts, Caroline Peay, Jill and Eastman, Nigel 2002. Mental Health Professionals' Attitudes Towards Legal Compulsion: Report of a National Survey. International Journal of Forensic Mental Health, Vol. 1, Issue. 1, p. 71. Department of Health (1998) Press Release 98/391. London: Central Office of Information. Secretary of State for Health (1999) Reform of the Mental Health Act 1983: Proposals for Consultation. London: Stationery Office. 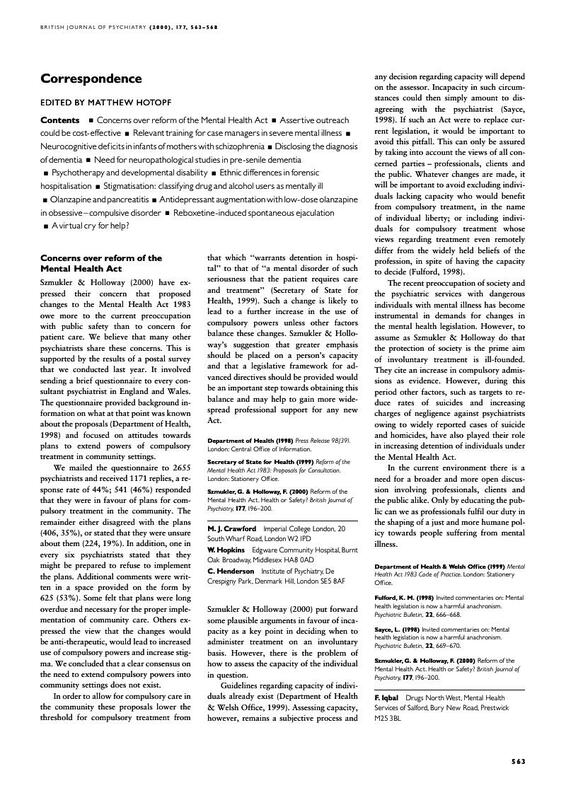 Szmukler, G. & Holloway, F. (2000) Reform of the Mental Health Act. Health or Safety? British Journal of Psychiatry, 177, 196–200.